Our review of RYANAIR and guide to using them! Up until a year ago we had never flown with Ryanair, I am not sure exactly why but we always thought it was a bit of a con, that the great prices advertised were not truly reflective of what you paid. We were also dubious of what sort of service you would receive. Fast forward 12 months and we are just about to take our 9th flight with them… here’s what we honestly think of Ryanair and how to get good prices! Generally speaking the prices are what attracts most people to use Ryanair and most often some great deals can be found year round. There website is fairly easy to navigate and you scan easily skip forward and backwards in time to check the variation in prices. They have frequent sales on and the prices advertisement can generally be found if you are flexible and either book within the allotted time for the sale or book quite early. These £9.99 fares over to Dublin are not a lie, we have booked them for a return trip and our upcoming one way flight. 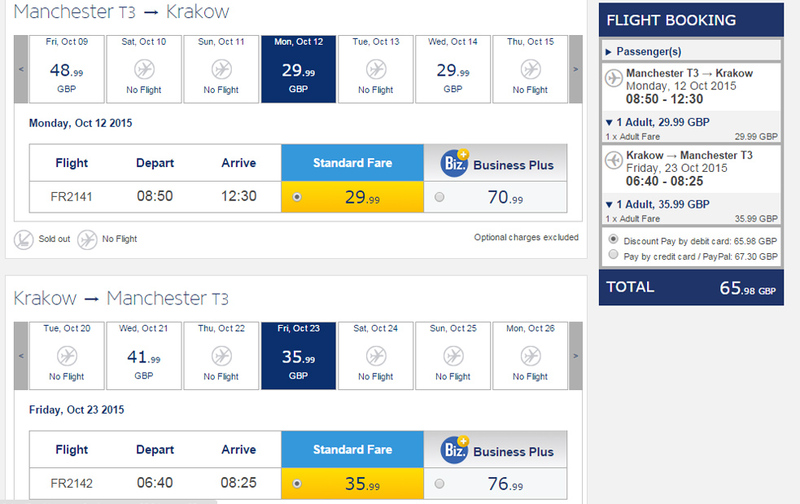 We also paid only around about £35 each way when we visited Krakow in November. The only issue I have found is that sometimes the prices come out way above what they should be if you catch the timing wrong, don’t be put off, just look for another day, time or month. They are out there, you just sometimes need to look for them! This is the big one isn’t it with Ryanair if we are all honest. The fear when booking with budget airlines is that we will end up stung with a list off fees for things we either don’t even want or are not really sure if we need! The trick with this is to make sure you read everything and take your time. We have been to Ireland and literally only paid £9.99… nothing else. So there is no reason why you shouldn’t be able to do the same. Most of the additional fees relate to things such as Travel insurance, quick boarding, allocated seats and baggage. Unless you want luggage, non of this is needed so scroll right through! With most of these you just need to skip through them unless you actually want a hire car or checked luggage. Of course, have a look elsewhere and make sure you can get them cheaper, but most of us will have our insurance sorted out else where and have no requirement for a hire car. Just scroll down and press continue!! What to really look out for is little things where they get you to check boxes and add on little extras that add up here and there that are totally not needed. Just keep an eye out on everything you fill in and tick and also the price at the side which the only real reason it should go up is for baggage and a small admit/ credit card fee of only a couple of £’s. Watch out for things like this that you don’t need! With Ryanair you can check in for a flight for free from 7 days before departure so no need to pay extra to do so (check in is available from 21 days for a fee of around £5). It’s really easy but make sure to double check your details as you enter them as changing them will land you with a hefty bill. Again here is an opportunity for them to charge you more, but again, there really is no need. Every time we have checked in online we have done is as soon as we could and had allocated seating, and for everyone we have been next to each other. Allocated seating done at the first opportunity and we ended up next to each other. The only frustration is that sometimes you can’t check in for both flights at the same time as the return will be more than 7 days away. The best thing to do is do each one as soon as you can to maximise your chances of getting better seats and just wait until you can do it for your return. Often hotels and hostels do have computers and printers you an use, or you can pay the £5 each to reserve a seat. You can just turn up at the airport and check in the old fashioned way and hope for the best! Allocated window seat over the wing! 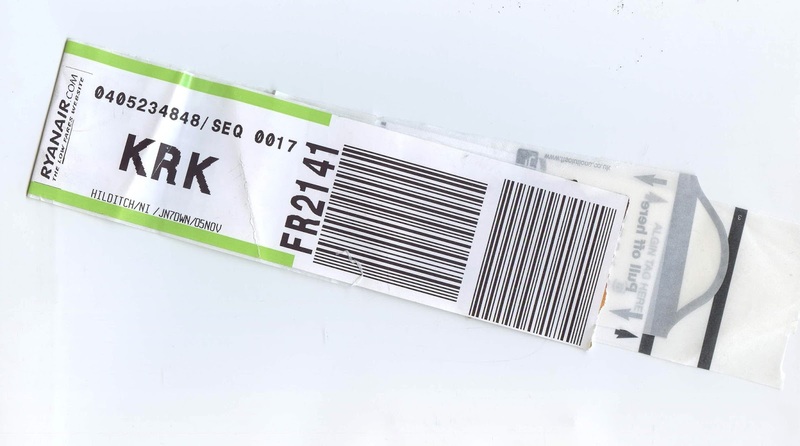 The biggest single problem with Ryainair would be their charges for checked luggage, it cost £15 for one 15Kg bag… add that for a return and you are paying £30 for a bag on a flight which might have only cost you £19.99 return! Sometimes of course you need a bag and you will just have to accept that if you want a bag larger than the allowed cabin bag range then you will have to pay. If there are two of you the best advice would be to make one case serve both of you which is what we have done when needed on longer trips. However, we have also gone several times with cabin bags only and despite what you might imagine their allowance is actually not too bad. We have taken a week long trip using a small suitcase and two normal/ day sized backpacks. It is most definitely possible to pack carry on only for a week+ (post coming soon). Just remember to put all your liquids in a clear bag and take bottles of no more than 100ml as per carry on regulations. One cabin bag weighing up to 10 kg with maximum dimensions of 55cm x 40cm x 20cm, plus 1 small bag up to 35 x 20 x 20 cms may be carried per passenger. Depending on how full the flight is and your position in the queue your bag might end up getting put in the hold, but if it fits the requirement they will not charge for this and your normal sized backpacks are usually exempt from this. As mentioned before when looking for a good deal you need to be flexible and one of the main issues with Ryanair is that in order to get the best prices you might have to settle for flights that leave really early or really late. This is just part of the deal with Ryanair and unless you want to pay more you will just have to arrange your transport around the times, research ahead or play around with your dates until it works out! Ryanair is no frills and it feels like it, little things such as having the safety card stuck to the back of the seat in front and no nice little net to put your magazine in below your tray table are details you might notice. However the staff are always courteous and helpful, if often a little preoccupied with trying to sell you overpriced food or a scratchcard. The flights themselves have been comfortable enough but I am not sure I would cope with a long haul journey on one of their planes. The ride isn’t always the smoothest but as a somewhat nervous flyer (secrets out of the bag now!) I haven’t felt anymore worried than when flying with say Japan airlines on the dreamliner… although I was more definitely not as comfortable or entertained, but for a 2-3 hour flight I can put up with that! What I have noticed about Ryanair is that their time keeping is a little strange.They have a short turn over which means that your plane is often not at the airport almost until you are ready to board. We have consistently set off around about 20 mins late due to this but have also always ended up early upon arrival. When I have checked the flight details the arrival time is always a good half an hour or even more later than you would expect for a flight of that distance and usually the captain will announces the flight time is significantly less than advertised. For example Manchester to Dublin is down as taking just over an hour… in reality the flight actually takes just over half an hour, but factor in a short delay and we ended up 15 mins ahead of schedule! I think this is probably clever scheduling on behalf of Ryanair to avoid fees and complains for lateness, but the long and short of it that despite being a little frustrating when you have to wait longer to board we have always arrived a little earlier than planned so I guess you can’t complain! Overall impression & would we recommend them? I must admit that we were skeptical of Ryanair before we flew with them at first and although we had used EasyJet a few times before we had always thought of them as being full of loopholes and tricks. However the fact that over the last year we have flown 9 times with them may give you the answer to the above question! Of course they are not perfect, far from it, but as travellers on a budget looking to see as much of Europe as possible Ryanair has allowed us to do that, with saving up for our RTW trip our budget it tight and without Ryanair we would not have travelled so much. We would whole heatedly recommend Ryanair to those people who want to get from point A to B for the cheapest price and are prepared to be flexible and also confident enough to dodge their charges online. It’s a great way to get around Europe cheap and quickly! Have you ever used Ryanair, what was your experience? Bookmark this article Our review of RYANAIR and guide to using them! Exploring the ruins of Castle DEVIN on the Slovak/ Austria border. Getting from BRATISLAVA (Slovakia) to VIENNA (Austria) and back!